There was a time when I went to graduate school up the hill from downtown Troy. Making it down to my favorite comic book shop, Aquilonia Comics on Fulton Street during lunch on Wednesdays (when the new books became for sale) was imperative. Around the block from Aquilonia is a fast-paced cafe/luncheonette, Francesca’s on Broadway. 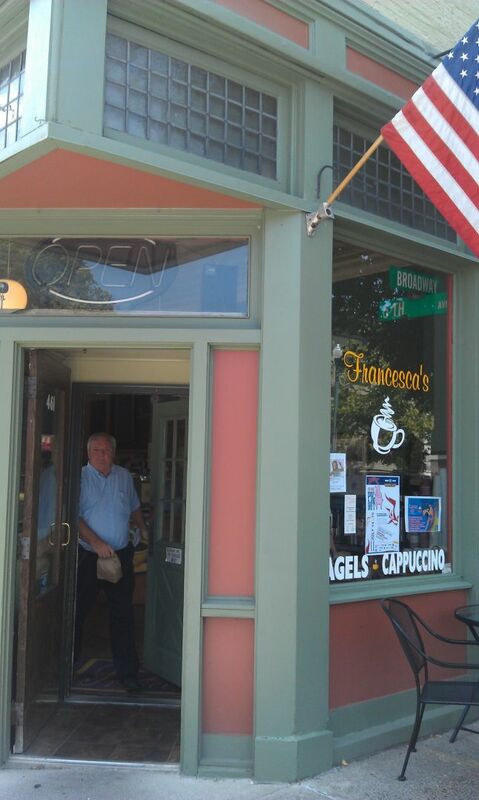 I used to enjoy a sandwich I liked to call “The Caprara,” turkey, smoked mozzarella, and Russian dressing on a panino roll, named after my friend Marc, whom I met in the comic shop and who introduced me to Francesca’s. It’s been five years since I last visited. I actually ran into Francesca at the now closed Cambridge Hotel on my first visit, which I thought was crazy, especially since I also ran into my favorite server in the universe there as well. Living in Altamont and working in Guilderland makes it difficult to get over to Francesca’s while it’s open, but, on a day that I took the afternoon off from work, I decided that comics and Francesca’s would make for a perfect afternoon. I mentioned that the place is fast-paced, right? Well, I arrived at 12:40pm on a Friday and the place was mobbed. The line was to the door, and all of the seats inside were occupied. By the time I made it to the front of the counter, a small table had opened, and I was able to sit inside and enjoy my lunch. 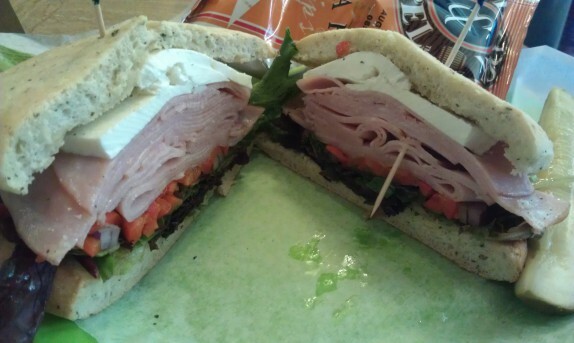 I ordered The Melo, a sandwich containing boiled ham, fresh mozzarella (side note: I always find it amusing when Francesca tweets about making her fresh mozzarella), field greens, red onions, roasted peppers, and olive oil (approx $8). By the time I had made it to the front counter, I had impulsively added a bowl of gazpacho ($4), a fresh brownie ($2), and a bottle of water ($1). 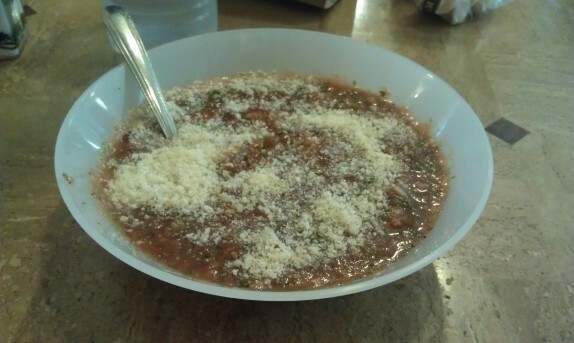 The first thing that was ready was the gazpacho, which, I don’t know why, I let the young lady who took my order put grated cheese on. Aside from the cheese, this was delightful. The dish was a beacon of freshness and had a subtle kick. I liked that it had some texture to it; it wasn’t pureed to smoothness. That rustic texture made it feel hearty and filling. I was almost too full for my sandwich. 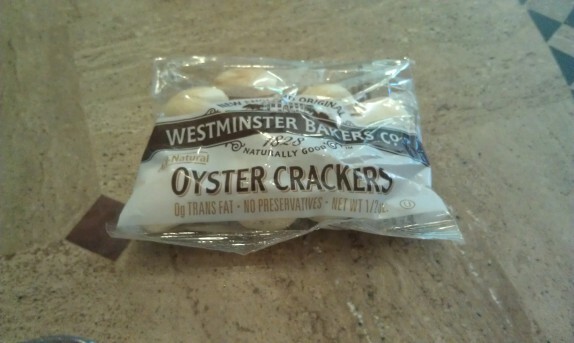 It was served with oyster crackers, which I didn’t use. Francesca was hard at work behind the counter trying keeping up with the orders; she was the only one working the sandwich station. After enough time for me to finish my gazpacho, the sandwich arrived. I knew it was going to be big. And I always get a cross-sectional view before I dig in. This sandwich was very good. Not quite as good as “The Caprara,” though. I loved that the sandwich was piled high. I love the cheese on top was freshly pulled mozzarella. 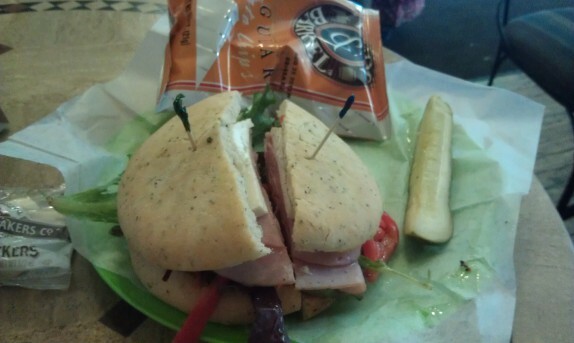 I loved everything on the sandwich, including the roll which seemed to have herbs baked into the crust. The olive oil was very nice on the sandwich, but I think it needed a bit more acidity and maybe a creamy dressing to drive it home. You’d think that the roasted peppers and fresh mozzarella would be enough, but I think there’s still something missing. Luckily, it’s a cafe, so you could order it however you want. [Side note: it was clear that Francesca was trying her best to accommodate some of the strange substitutions other customers were making on their orders.] I might ask for oil and vinegar next time, or maybe mayonnaise. Easy enough. I didn’t finish the chips and pickle that came with the sandwich because I really couldn’t wait for that brownie. 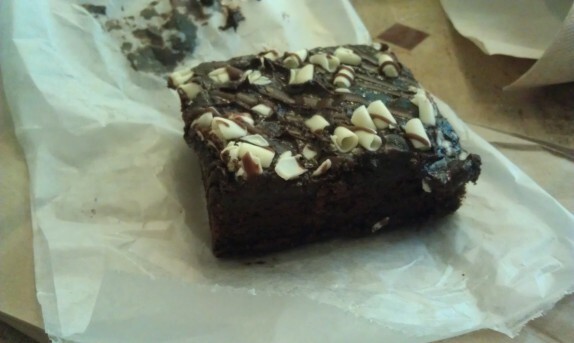 What can I say about the brownie? It was decadent and large. The whole thing was so chewy that it was falling apart, and that’s a great thing. All of the pastries and desserts look awesome! Stopping back in for the first time in a while made me wish I worked in Troy. what a compliment considering Jerry’s dad owns the best salumeria in the Hudson Valley Region and has the best xappicolla I’ve tasted world wide. I definitely do! As for the weekends, just a few blocks up on Broadway is Illium Cafe, another amazing and humble place!